Phosphatidylcholine Assay | Cell Biolabs, Inc. Cell Biolabs’ Phosphatidylcholine Assay Kit measures the phosphatidylcholine present within serum, plasma, or tissue samples.Samples are compared to a known concentration of phosphatidylcholine standard within the 96-well microtiter plate format. 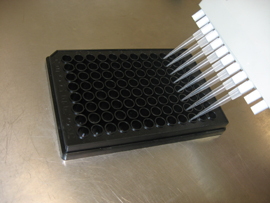 Samples and standards are incubated for 60 minutes and then read with a standard 96-well fluorometric plate reader. Park, E. S. et al. (2014). Phosphatidylcholine alteration identified using MALDI imaging MS in HBV-infected mouse livers and virus-mediated regeneration defects. PLoS One. 9:e103955.